Jo was diagnosed shortly after his birth with 2 genetic disorders as well as global developmental delays this 12 year old boy has tween attitude and an infectious smile. 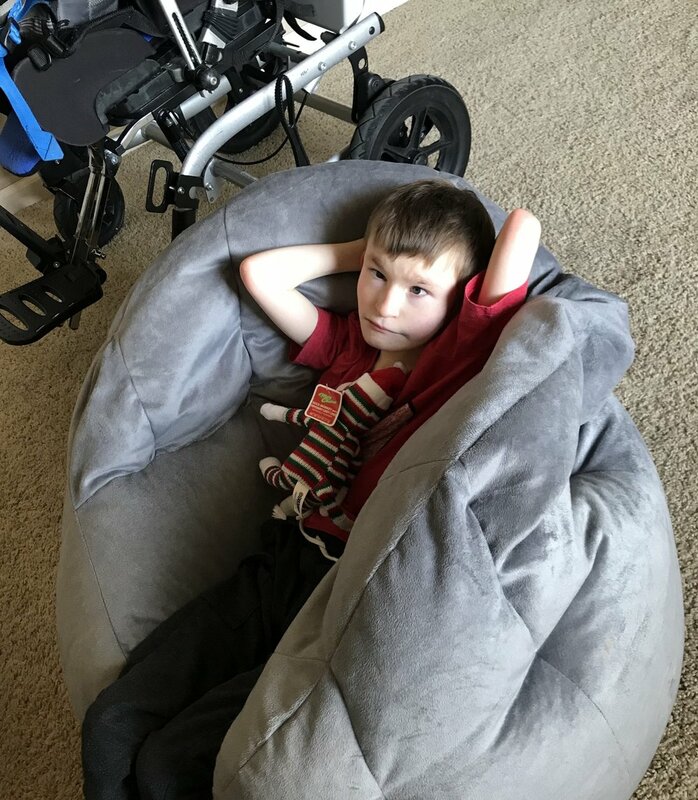 As Jo is non-ambulatory and non-verbal, we are bringing his love of the outdoors into his room where he can hangout while recovering from an exhausting day of physical and occupational therapies. On January 8 2006, my joy was born but my world turned upside down. I was totally prepared to be a single parent however I was totally unprepared to be a special-needs parent. Josiah's birth weight was under 4 pounds, he had no baby fat, no eyelashes, and we knew something was very wrong. About a year later we completed genetic testing, the results answered some questions but not all. Jo, he prefers to be called Jo, was diagnosed with to 2 genetic disorders. CMT1A a degenerative neuro-muscular disease. And chromosome 2P Duplication Disorder which accounts for most of his global developmental delay, Autistic behavior plus a hodgepodge of other medical issues. He is nonverbal and non-ambulatory. To list all his diagnosis that fall under those two umbrellas would take half a day but that isn't what's important because Josiah is so much more than the sum of those parts. Today he is a 12 year old tween with an attitude to prove it. He loves Elmo, Clifford, and any movie by Dream Works films, especially the Bee Movie. I suppose that’s because his favorite colors are yellow and red. Yes it's been a very long journey in 12 years we’ve had a total of 15 surgeries. and countless tests and procedures. There have been times of tears, times of uncertainty, and times of laughter and rejoicing when a report came back with good news. My sweet Josiah is lovely! He is a perfect balance of sweetness and ornery. He has taught me to look inside myself and dig deep deep down to find strength I didn't know I could muster and then I look at him and think I don't know how you can still put a smile on your face but you know what he always does! Josiah truly is made of the toughest stuff on earth. If I had to describe him in one word it would be so incredibly hard to choose because he is brave, he is goofy, he is smart. But, the one word I would have to choose is perseverance! No matter what we face, no matter what new challenges or medical problems come up he faces it with a perseverance that is inspirational. In fact he smiles at me, and pulls my hair a little every time I kiss his head, hug him and tell how much he inspires me. As a parent I wish to God I could take his place, that I could go through the pain instead of him. This year has been a very rough one. We had a hiatal hernia surgery and he has not been the same since. But we will face this obstacle in our journey just like all the others with time and patience perseverance and a clear plan of action. Thanks for letting me share a bit about my incredible Josiah!